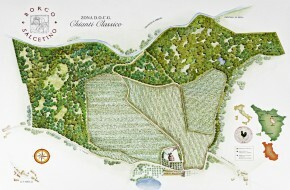 Borgo Salcetino was established in 1996 when Valneo and Tonino Livon, two Friulan winemakers decided to spread their skills in winemaking to the Chianti Classico area, precisely to Radda in Chianti. The estate comprises 30 hectares, half of which are dedicated to wine growing. An important gradual renovation of the vineyards has been carried out, which included reaching a density of 7000 plants per hectare, and improving the quality of the vines, and integrating the current native Sangiovese and Canaiolo with an experimental Merlot. The winery and cellars have also undergone extensive renovations in terms of technology but have maintained the original local characteristics. Wonderful underground cellars house the oak barrels in which the Chianti Classico, Chianti Classico Riserva wines and our Rossole age to perfection. The Livon Family has experienced a wonderful friendly atmosphere as newcomers. The locals are warm-hearted and bearers of ancient values, and it is always a pleasure to spend time together chatting in front of the great fireplace, during memorable dinners and celebrations. Vineyard: located at Lucarelli in the municipality of Radda in Chianti. Kind of ground: Lime, clay, sand. It is a garnet red color. On the nose it is intense, ranging from fruits of the forest to cherries. On the palate it is full-bodied with soft tannins and a long finish. The grapes are harvested by hand using boxes, followed by gentle destemming. The fermentation takes place at a controlled temperature of 23°C on the skins for twenty-one days. The malolactic fermentation takes place entirely inside new Barriques. There follow twelve months of maturing in the same Barriques at a constant temperature of 16°C. At the end of this period, the wine is assembled and bottled. There follows a further period of refining in the bottle. Drink with: pasta dishes with ragout, grilled red and white meat, poultry, mature cheeses and typical cold cuts.